CGIAR, a global network for agricultural research, is at work on an initiative that could better equip smallholder farmers and decisionmakers for the shocks of climate change. The CGIAR Platform for Big Data in Agriculture aims to democratize agricultural data and encourage a collaborative approach to addressing major food system problems, especially in regions where there is limited access to resources and negative impacts are more severe. “CGIAR is the only international agricultural research organization that has its feet on the ground collecting data relevant for smallholder farming and agriculture in developing countries,” Dr. Martin Kropff tells Food Tank. “That is why it is important to start the Platform.” Kropff is Director General of the International Maize and Wheat Improvement Center (CIMMYT) in Mexico, one of the 15 CGIAR research centers. CIMMYT uses agricultural systems research to address food insecurity and malnutrition, climate change and environmental degradation through more productive maize and wheat farming. The CIMMYT Germplasm Bank, which houses over 28,000 seed samples of maize and over 140,000 of wheat, incubates crop-breeding research that produces seed varieties designed to better withstand climate stressors, produce higher yields, and provide more nutrition. CIMMYT seeds reach 600 partners in 100 countries and more than 50 percent of wheat and maize grown in developing countries derive from CIMMYT breeding materials. 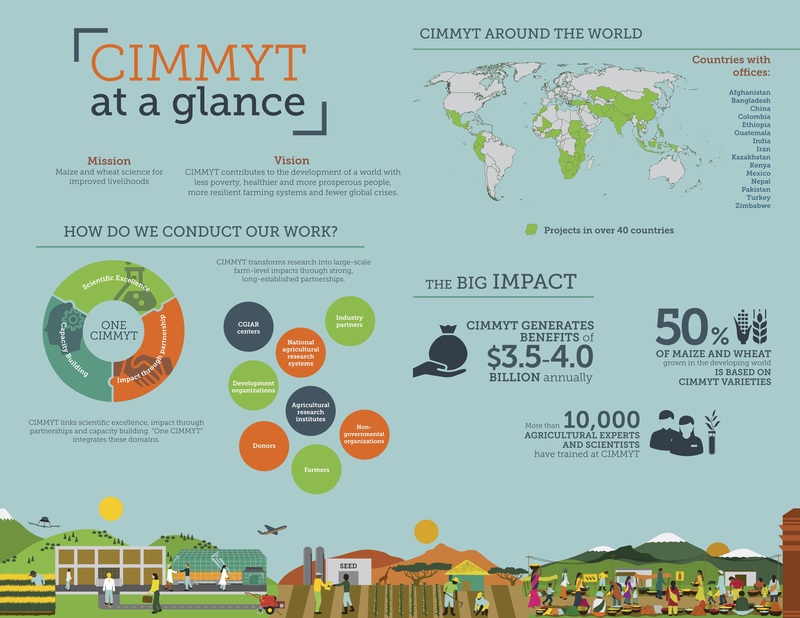 The breadth and scale of CIMMYT crop-breeding research already produces visible impacts. But according to Kropff, this impact could be enhanced by the Platform and its Communities of Practice (CoPs). There are six CoPs that work to fulfill the Platform’s mission to convene data, technology, and resources across Centers and develop the open access and open data standards and protocols for use across CGIAR Centers. CIMMYT leads the Community of Practice on Crop Modeling (CoPCM), a form of foresight research that aims to predict the impact of climate change on crop performance. Members of the CoPCM conduct and share quantitative research to better understand the interactions that exist within cropping systems, and create responses to potential shocks that could negatively impact those systems. “Clearly we have made progress in Big Data,” Kropff says, “but in our basic understanding of crops, we still have a long way to go.” Increased access to more and better agricultural data provided by the CGIAR Platform could help close the distance and put better tools in the hands of farmers in developing countries, increasing food availability and reducing losses due to climate change. One project that could benefit from Platform is the Sustainable Modernization of Traditional Agriculture program (MasAgro), an initiative of CIMMYT and the Ministry of Agriculture, Livestock, Rural Development, Fisheries and Food in Mexico to develop and promote sustainable maize and wheat production and increase farmers’ incomes. MasAgro is a collaborative project that incorporates local farmers, seed companies, and governments into crop-breeding research initiatives. According to Kropff, there are 300,000 farmers on 1.2 million hectares of field involved in the program and the results so far are positive. Crop yields are improving because of better fertilizer treatments and better seed varieties. MasAgro is also trying to enhance traceability. Demand for sustainably-sourced, high-quality seeds directs big business to smallholder farmers producing improved seed varieties. This sort of impact that stretches across multiple stakeholders in the agriculture system is pivotal to creating sustainable change in the food system and could be enhanced by widening the channels of communication between researchers.